Earlier, on Christmas Eve 2008, Madoff and his wife apparently botched a suicide bid soon after Madoff’s multibillion dollar fraud was exposed. “I don’t know whose idea it was, but we decided to kill ourselves because it was so horrendous what was happening,” she says. They took pills and woke up the next day, It was very impulsive and she is glad that they woke up, according to Mrs. Madoff. Bernard Madoff said that after the attempted suicide, he is ‘lucky to still be sane’ and left in him his sense of humor while in prison. During four months he spent in a New York jail, Madoff said, he was on suicide watch. He considered killing himself, but he “didn’t have enough courage to do it”. The 73 year old former chairman of the Nasdaq, is troubled by anger and turmoil within his own family. 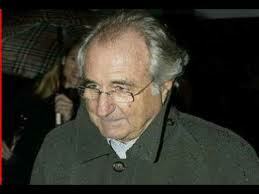 He has not spoken to his wife, Ruth Madoff, since after the suicide of their son, Mark Madoff, on Dec. 11, 2010. But after their son’s suicide, the couple had an emotional final meeting at the prison at which Ruth Madoff “asked me to let her go, which I understood,” Madoff said.